French pedestrians have the reputation of being a law unto themselves—but an unusual study has provided some scientific backing for the stereotype. 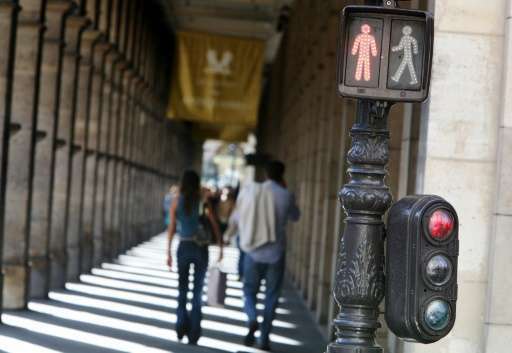 Four times out of 10, French pedestrians cross the road when the lights are against them, according to a paper published on Wednesday. In disciplined Japan, though, the rate is 20 times lower. Cedric Sueur of Strasbourg University in eastern France led a team that analysed behaviour at three pedestrian crossings in Strasbourg and four in the Japanese city of Nagoya. The researchers recorded 3,814 crossings in Strasbourg and 1,631 in Nagoya. The rulebreaking was vastly different between the two countries—in France, 41.9 percent of crossings took place against a red light, but this was just 2.1 percent in Japan. Men and young people aged 20-30 were more inclined than women and older people to cross illegally. Different degrees of social conformity explain the gap in behaviour between the two countries, researchers reported in the journal Royal Society Open Science. "The French have less respect for the rules... We are less concerned with social approval," Sueur told AFP. "It's not that the fear of a ticket is bigger in Japan than in France. It's that people (in Japan) are more concerned about the opinion of others." The role of group behaviour on pedestrian traffic is a major factor in safety, the study found. Such research "could help target specific preventive, culture-specific solutions for pedestrian safety," it said. According to the World Health Organization (WHO), nearly 300,000 pedestrians lose their lives on the road every year. "The French have less respect for the rules... We are less concerned with social approval,"
Funnily enough this was similar in germany when I was a kid. Then they started to campaign not with a 'social approval' slant but with one geared towards setting an example. Signs started to pop up at intersections with slogans like "setting an example for children" and the like (some of these are still around). And it worked. The idea is slightly different. In the quote from the french researcher social approval (in this case disapproval) isn't working - because it is a negative outcome. Being able to set an example, on the other hand, puts emphasis on a positive action, which in turn bolsters self-esteem. I wish the UK was more like Japan, we have no rules what so ever. People just cross where they like and it's pretty much always the driver's fault if one of these stupid pedestrians is hit. I saw similar to Japan when I visited Germany myself, people looked at you like you were some complete weirdo for crossing at a red light, despite no there being no cars in sight anywhere. Of course, undesirable cultural differences in response to specific stimuli do not exist if the evaluated culture is not the dominant culture, because any report of such statistically-significnt differences would immediately be classified as biased. When pedestrian movement is controlled by red (and green) lights, there are psychological effects. Many people naturally want the right to decide for themselves, but a few of them are happy to give up this right in exchange for what they incorrectly regard as perfect safety (but still should need the pedestrian to look for a vehicle which may be passing against the green-lit crosser). Because the green light does not guarantee perfect safety, It would be better if the law on crossing on a red light were made so that liability for the risk of an accident is determined by the color of the light, rather than action of crossing on red is made illegal.